The effect that the sound of Himalayan singing bowls have in the body is something that has to be experienced to be understood. Even after that, you might not be able to really explain it. The feeling of the sound waves in your body is hard to describe. One thing is for sure, it’s a delicious treat! Sound Therapy is a practice that uses the sound and vibration produced by certain devices to cause an effect in the body. The sound produced by the Himalayan singing bowls is particularly pleasant. It’s really soothing and beautiful. It also has therapeutic purposes because it leads the patient into a state of deep relaxation that enables the body to restore and heal itself. This helps your body activate its innate ability to heal by deactivating the sympathetic nervous system (responsible for our survival fight it flight instincts) and activating the parasympathetic nervous system, responsible for rest and digestion. ENTRAINMENT: Physics teach us that waves that oscillate near each other eventually coordinate and syncs to each other. This is what the sound waves do to the brain. The noise at 450hrzt syncs with the brain waves. Reduces the brain waves to a lower frequency that deactivates the parasympathetic system. This induces the state of meditation where no thoughts are present, without you putting any effort. You just need to relax and be receptive. HOMEASTASIS: When doctors apply a treatment or they would always ask patience to rest to enable healing but we rarely do it. When a bone breaks they align both pieces and put a cast on to make sure it stays put, resting, and the bone then heals. Calming the mind is like a cast, to calm the body and vice versa. Calming the body is an easy tool to calm the mind. The monkey mind needs constantly something to fidget with and we give it the sound. Removing the interference in the mind allows the body to divert resources to other duties. When the mind is calm the body is at rest, not distracted, and It has more energy to perform its usual maintenance duties. On an mental level the bowls produce really unique sounds with a tone an the frequency, makes the brain synch and switch off, making you go into a kind of trance. When played in a prolonged manner the constant tone makes you sink into a deep state of consciousness. At 7-8 (Hertz) cycles per second, musical tones cause our deeper intelligence, creativity, and self-healing mechanisms of the body to become activated. ln a natural deep sleep this is supposed to happen naturally, but unfortunately this is difficult to obtain nowadays. We live in a world that’s constantly bombarding the senses and exciting the mind. We simply don’t get enough good quality, restorative rest. Rest is the key. When the mind is busy, stressed, even in our sleep, the breath automatically becomes shallow. Less enough oxygen gets to the cells, and our natural healing becomes more difficult. On a physical level it’s actually nothing mysterious. 80% of the body is water and sound waves travel better in this medium. Sound is a non invasive tool to penetrate inside the tissues and massage the muscles, nerves etc. from inside. The sound of the bowls is indeed very pleasant but it’s the vibration that matters. It’s penetrates deep, helping release tension, ease pain. On an energetic level, the vibration and the chakras. When sound is matched to the optimal vibration of a chakra, for example, and it persists for long enough, something amazing happens.Our energetic body responds to match this vibration. Specifically, the chakra or energy center of closest match has a knowledge that this is the status quo, and it moves to match the vibration. The sound of the bowls is revered by Tibetans as sacred, and it’s believed to have healing properties. According to Tibetan tradition, the existence and use of these bowls has been around for almost 2600 years. This would put the singing bowls right around the time of the living Buddha, suggesting that maybe he had something to do with the practice. But while Buddhism in general uses these bowls, it’s Tibetan Buddhism that made it popular. WHAT USUALLY HAPPENS IN A SESSION? A group session is what we call a sound bath, which is a guided meditation playing singing bowls. 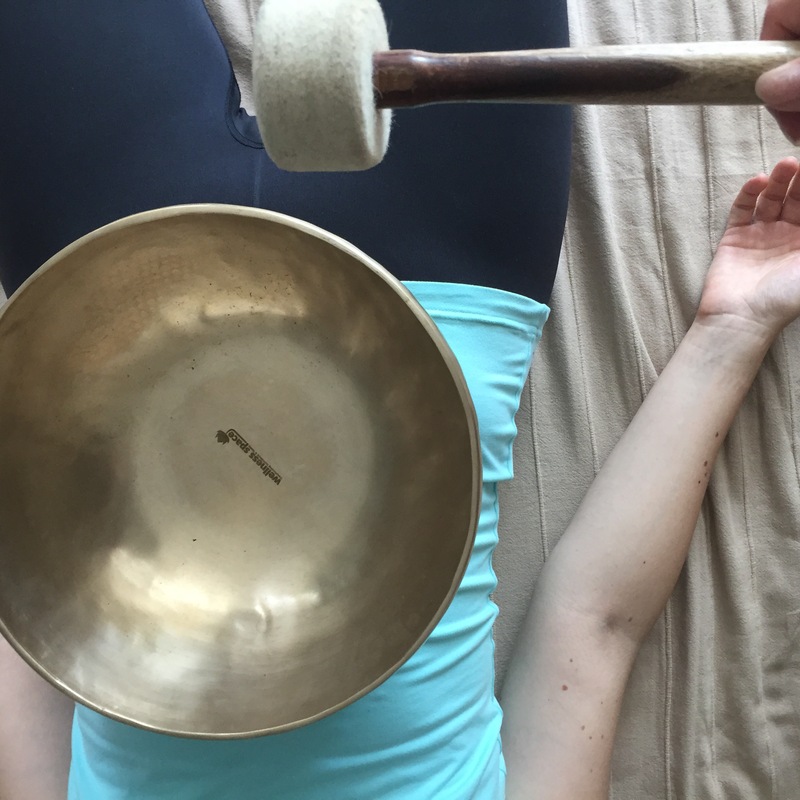 Sound Therapists play different techniques in a specific sequence to relax the body and the mind but also to bring awareness to your body and your problem areas. I these sessions it’s likely that the therapist mixes sound with other meditation techniques. Individual therapy sessions last about 90min and are fully customized to the student. There will be a small briefing about how sound works as a therapy, then chakra readings will be performed followed by a discussion between therapist and patient before the actual treatment. The chakra readings can bring up things that are quite personal so this is only down in one to one sessions and I personally keep it strictly confidential. Different bowl playing techniques will be played depending on the readings and the objective of the session. The bowls vibrate are frequencies that are similar to the ones of of the chakras, so if a chakra is unbalanced in 95% of the occasions (some require a few sessions) it will be fixed after the treatment. The patient can actually see that in the readings. At the end we will discuss the experience, have a Q&A and establish the follow up if needed. These sessions are conducted exclusively at my home studio.